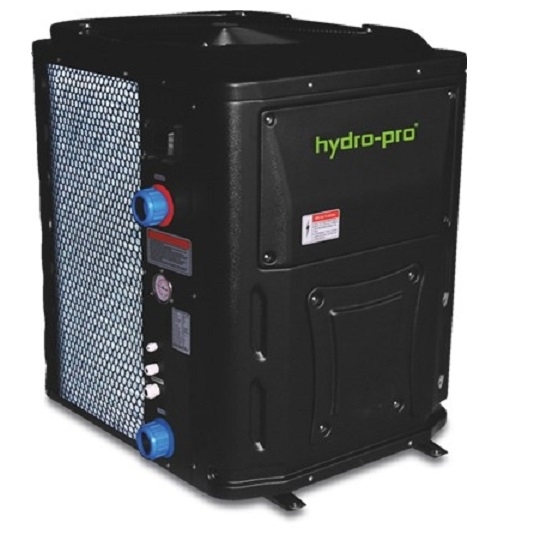 Hydro-Pro 18 Swimming pool heat pump. Operates down to an outside air temperature of -5°c. Heats pools up to 80 cubic metres. COP @ air temperature 25°c = 6.2. All models have titanium heat exchangers. Quiet running via rotary & scroll compressors. Latest models R410A ozone friendly refrigerant. Two year guarantee on system. Requires a water pump with a minimum 4.6 cubic metres hour flow rate to operate correctly. 240V Single phase model - Running current 11.4 amps, we recommend the MCB circuit breaker controlling this circuit is a type D circuit breaker, if you are not sure contact us for help. Amongst the features of the Hydro-Pro18 heat pump are a long life heat exchanger made of titanium. Advanced microprocessor control ensures this heat pump runs and its optimum efficiency no matter the conditions. This model delivers 18kw of heat output and is suitable for heating pools of up to 80 cubic meters. This model requires a single phase 240V power supply and these new models also feature a soft start features to limit current drawn from the mains supply.